These potent and 100% pure essential oils are available at TheHerbsPlace.com. If you think children’s birthday parties are getting out of control, BirthdaysWithoutPressure.com will raise awareness of this problem and offer alternatives for parents and kids who want birthdays without pressure. This began with a small group of parents and professionals in St. Paul, Minnesota with a vision to launch a local and national conversation about birthday parties without all the stress. Read how they got started and what is out of control and get ideas for parents. Have You Found A Clever Use For Ice Cube Trays? Ice cube trays can be used for so much more than making ice. Tell us how you use yours. I freeze leftover wine in an ice cube tray, and when a recipe calls for a splash of wine, I pop one in from a Ziploc bag! Also useful to cool down white wine - with the same ice cube! I also freeze whole strawberries in the tray, and store in Ziploc for months. Instead of ice cube trays, I use the clear plastic ... Read the entire article. Whenever you donate money, order a product or service, or fill out a warranty card, write in large letters, "Please do not sell my name or address". Most organizations will properly mark your name in the computer. Product warranty cards are are often used to collection information on your habits and income, for the sole purpose of targeting direct mail. They are not required in most situations - avoid sending them. On the telephone, ask "Please mark my account so that my name is not traded or sold to other companies". Your credit card company probably sells your name the most often -- keep reading for techniques to stop it. Select a false middle name or initial for each charity or business you deal with. Keep track of which letter goes with which organization. You can also select a false road designator, "avenue, place, circle, street, highway, parkway, etc.". This step can be very revealing. Some guides recommend changing the spelling of your name, but this can lead to duplicate mailings. To stop specific types of unwanted paper mail, click here. Safety nets fray when times get hard. Retirements that once looked secure are hanging by a thread. The message for those in their 50s is clear: Mend the nets while there’s still time. Those in their 60s and 70s have fewer options. Still, there are ways of making sure your money lasts for life. Here’s how to do it in 12 easy steps. Dreaming of a new dishwasher? Now may be the time to buy. States have finalized their plans for the government’s “Cash for Appliances” program and will begin issuing rebates in coming months. You can get rebates—the amounts vary—if you buy new, energy-efficient major home appliances. The $300 million program is funded by the American Recovery and Reinvestment Act. Unlike the Department of Transportation’s popular “Cash for Clunkers” car deal, the appliance program allocates funds to each state, and states decide which Energy Star-designated appliances and consumers are eligible. To check your state’s program, go to www.energysavers.gov. Sid Kirchheimer writes about health and consumer issues at AARP Bulletin. The Story of Stuff Project is excited to announce the release of Let There Be...Stuff? - a six-session curriculum that helps Christian teenagers explore the relationship between their consumption, theirfaith, and the health of the planet. To celebrate Earth Day, we're offering this incredible resource for free to the first 1,000 houses of worship or faith leaders who sign up to download it. If you are a minister or lay church leader, youth group or bible study coordinator, we encourage you to download the curriculum here today. We will also be offering a version for Jewish communities in the coming weeks. Over the past five years, the pace and scope of religious engagement on the environment has accelerated sharply. Our Project experienced this phenomenon first hand when we releasedThe Story of Stuff in late 2007. Almost immediately, faith leaders started calling and writing to ask if we had produced companion educational programs for churches or other houses of worship. Then last year, we partnered with GreenFaith - an interfaith coalition for the environment-to meet this need. Our 6-week series for teenagers of faith is designed to help them understand the problems the planet is facing, raise awareness of the changes needed and empower them to develop environmentally sustainable patterns of consumption that honor creation and deepen their spiritual lives. Its chock full of hands-on exercises, thought-provoking questions and great group activities. 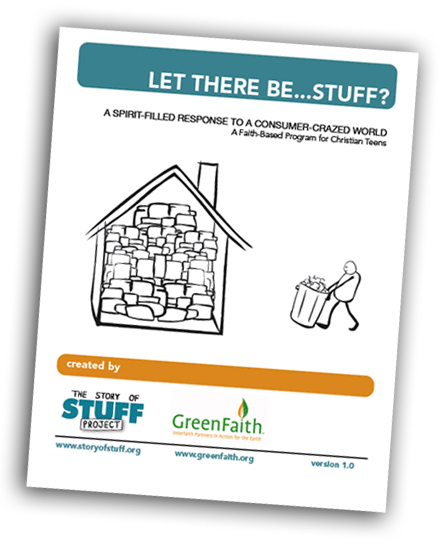 You can support our release of this program by downloading it yourself for use in a confirmation class, bible study or other church youth group; by passing word of this release on to your own house of worship; by providing us with feedback so we can improve the program; and also by contributing to the non-profit Story of Stuff Project. Your contributions will help us provide the guide for free to hundreds of houses of worship around the world. Stay tuned for the release of our high school curriculum this summer! It's easy to love butterflies. But for many gardeners, attracting these beautiful pollinators is where the infatuation with insects begins and ends. Invite carrion beetles and assassin bugs to a flower border or vegetable patch? Only the intrepid dare go there. Yet there are good reasons to create a backyard buffet for these and other so-called beneficial insects (robber fly, left). They are the tigers and barracudas of the insect world, preying upon many of the organisms that ravage prized garden plants. So many homeowners have pest problems largely because their yards are not inviting to the predators and parasites that in natural ecosystems keep pesky creatures in check. Although a number of biological pest controls—the fancy term for beneficial insects—are sold at local nurseries and mail-order suppliers, the most effective way to entice predators to patrol your yard is to grow their favorite flowers. Winter, when you’re perusing the pages of nursery catalogs and dreaming of spring, is a great time to look for the blooms these creatures love best: asters, coneflowers and other daisylike native wildflowers, as well as popular culinary herbs such as dill and parsley that produce inverted parasol-shaped inflorescences. Read the entire article. A year and a half ago, someone gave me a 50cc scooter. It was of uncertain foreign brand and I could not figure out how to even change the oil. None of the shops in my area would even work on it because they did not know where to get parts for it. People mocked me for driving that scooter, but it sure was convenient since we only have one family vehicle and in our state, scooters under 51cc do not have to be licensed, registered or insured. Between adding a little oil now and then and buying gas, I drove it for about $3 a week. Anyway, I drove it to work most days of the week all until it was stolen about six months ago. I think someone just picked it up and threw it in the back of a pickup truck and that was the end of it. Anyway, I have started to look for a replacement scooter on Craigslist, Ebay, used motorcycle shops and pawn shops. We have a surprisingly large number of the latter in our area. I have always been fascinated by pawn shops, but I think I had only entered one once before the past couple of weeks. I did not even understand what it meant to pawn something until recently. I think I have discovered a new hobby. Our family frequents second hand stores and rummage sales on a regular basis, but I have found pawn shops to be much more exciting. Second hand stores seem to have nothing other than clothing and broken furniture. Pawn shops have tools, electronics, jewelry, bicycles, musical instruments, televisions, guns – all kinds of cool stuff. My wife pretty much assumes that everything in there is “hot”. I think that might be an exaggeration, but it certainly adds to the excitement factor. If you were like me and did not know much about pawn shops, I have picked up a few pointers ... Read entire article. Leslie Clark spent less than 24 hours in the hospital during an attack of diverticulitis. But she felt even sicker when she saw the bill: $10,206. So Clark, a New York TV writer, turned to a medical negotiation company. Healthcare Mediation sliced Clark’s bill by $5,200. She paid $769 for the service, but such companies usually collect up to 30 percent of the amount the bill is reduced. They employ skilled negotiators before or after a procedure to see whether the client has been overcharged, is insured or qualifies for other coverage and compare costs elsewhere to use as leverage. One firm, Medical Cost Advocate, says it saves its clients money 80 percent of the time, with an average savings of 20 percent of the bill. For a list of medical negotiation companies, go to Medical Billing Advocates of America. Article Source: AARP Bulletin - March 2010. On Sale Tuesday and Wednesday ONLY! ALJ is a key product for the respiratory system. It provides nutrients that must be present for proper respiratory system function. This formula supports healthy lung function and helps support the body during seasonal changes. It also encourages the entire respiratory tract to gently cleanse itself and helps promote respiratory tissue health. The B vitamins offer many health benefits. They help promote energy, maintain the nervous system, improve immune functions and buffer the effects of stress. Notably, the B vitamins influence the health of most of the internal organs of the body and may reverse the pathogenic courses of many diseases. Bee Pollen is a true gift from Mother Nature. It is rich in minerals and vitamins, including calcium, magnesium, manganese, potassium, zinc, riboflavin, thiamin and vitamins A, B6, C, D, E and K, and includes 12 different unsaturated fatty acids. It also contains biotin, a vitamin that is important for the skin, hair and nails. LBS II is designed to support the production of digestive enzymes and bile, thereby promoting the growth of friendly colonic bacteria. It also provides nourishing natural substances to feed the colon and support it in its eliminative functions. Magnesium Complex combines two excellent forms of magnesium citrate and malate. Studies show that magnesium citrate and malate are more soluble and better absorbed than the other forms of magnesium. Let's face it, sure everyone goes to college to get an education but they also go looking to have some fun. For most, it’s their first experience away from home and being on their own. However having fun comes with costs and most college students are on a tight budget. Here are some ways to have fun for less! 2. Explore ... Read the entire article. Hazel Lilly wasn’t the first person to be swindled by a caller asking for help, and she won’t be the last. But her case shows why the pervasive “grandparent scam” is more dangerous than ever. The bait is usually the same: Someone claiming to be your grandchild calls, saying he has been arrested or hospitalized while visiting Canada—and is afraid to call his parents. He needs quick cash in the form of a wire transfer. In 2009, American grandparents admitted sending at least $4.5 million after being ... Read the entire article. 3. When you move, borrow a truck (if you don't own one) from a friend or your employer to transport your possessions. Also, get some of your friends to help load your things (and unload them too). The above should be your cheapest way to move. Be sure to call your homeowners insurance agent concerning coverage of your possessions during the move. 4. If you can't borrow a truck for your move, the next cheapest way should be to rent a truck, such as a U-Haul or Ryder truck. Do your own packing, loading, unloading, and driving. If you don't have one or two people to help with the loading and unloading, you usually can hire a moving company to load your vehicle at your present residence and unload it at your new residence. If you are moving a considerable distance away, you shouldn't have any problem hiring a different moving company at your destination to unload the truck. This way of moving will be much less expensive than hiring a professional moving company to do the complete moving job. Before you actually go to rent the truck, talk with your homeowners insurance agent about coverage on your belongings during the move. 5. Get estimates from several different moving companies if you're going to utilize professional movers. Set up a time for them to come to your home to look at your belongings. Rates could vary considerably among moving companies. 6. When you are calling around to compare prices, ask the moving companies if their charges are cheaper during certain months of the year and certain days of the week or month (nonpeak times). Move when the rates are the lowest, if at all possible, and save yourself some money. 7. If you hire a moving company to do your moving, make sure you understand what the company is liable for if some of your possessions are stolen or damaged during the move. If this coverage is insufficient, consider purchasing additional coverage unless your homeowners insurance covers your goods in transit. Not having adequate coverage during your move could cost you money out of your pocket if damage or theft occurs. Read the other 6 ways. Here are some saving dimes tips that allow you to enjoy your vacation without spending an abundant amount of money. Plan Ahead - Plan your vacation in advance. Know how much you can afford and how much you are willing to spend. Then you can plan when and where to go and what to do once you're there. Don't Buy Expensive Travel Guides - Do research on the web; you'll be saving dimes opposed to spending money on travel guides and maps that you may only use once. Cash Withdrawals - For your vacation try to take out money before you leave on vacation or in large amounts once you reach your destination so you will be saving dimes on withdrawal fees if you aren't using your bank ATM. Avoid Traveling During Hot Seasons - If you want to go somewhere warm, go during their off-season, and avoid the weekends. For example, Florida is warm almost all year round but its peak season is the summer when kids are out of school, so wait for your children's Christmas break or yours, where the temperature will be cooler but you wont be fighting the crowds at theme parks and attractions. Stay Flexible - When planning your vacation try to stay flexible on dates and times. Request that you would like the cheapest offer and that you are open to suggestions such as other dates if the price is cheaper. You can also take advantage of promotions and off season tickets. Telephone Numbers - Before leaving for your vacation, get any ... Read the entire article. Q. We are moving in three-four weeks from New Mexico to Ohio with three kids, a dog, and two cats. I have always used rental trucks and loaded and driven myself when we've moved in the past, but with gas prices what they are, I was thinking that by the time I pay for the truck and insurance and gas, I may spend about what movers cost. Can anyone out there shed some light on movers? I have no clue what to expect other than what Gary Foreman wrote on the link you gave. I want to pack my own stuff, and supervise (at least) the loading and unloading to protect my stuff. Also, to add a little extra challenge to an already overwhelming thing (to me), the local truck rental facility tells me they are unsure of exactly when they could promise me a truck because most are on location at fire clean up sites in the national forests. I think its great, but I need to know when I'm moving. A. Just a thought about hiring movers - this isn't to say that ALL people are dishonest but....when my mother in law moved a few years back, she decided to hire a moving co (granted they weren't a big co like Atlas or something but they were a legit moving co) She decided rather than having all the kids (all adults) move her she would do the co. Anyway, she was moving only a few hours away. The truck left BEFORE us - we made the mistake of NOT following it....we arrived quite awhile BEFORE the truck (we never saw it on our way there) When her things were unpacked we found several items missing that we KNEW had been put on the truck - of course we couldn't prove a thing and she was afraid since they knew where she was now living she didn't want to contact the co. She felt it was over and done. I have to also admit, I work in a small town in Massachusetts - I had seen many times a big moving truck (like Atlas or some other big name co) in a field loading/unloading items - don't think it should have been done. We have always moved ourselves. A lot of work but when you do it you KNOW your things are being delivered. A. Unfortunately one of the most stressful things in life is moving. I know first hand from moving myself after 13 yrs. in the same house AND because I used to work for a moving company. A couple of words of advice... Read the entire article. Americans are snapping their wallets shut and socking money away amid economic doldrums. The nation’s personal savings rate—hovering at zero just two years ago—has risen to about 5 percent—the highest rate in 15 years, according to the U.S. Commerce Department. Experts say paying down debt and saving more is a sensible response to job layoffs, declining home prices and dwindling 401(k)s. Smart people, particularly those age 50-plus, are going to have to save. “If you don’t want to work forever, ultimately you’ll be responsible for paying for retirement,” says Dallas L. Salisbury, CEO of the Employee Benefit Research Institute (EBRI). Still, saving money seems like dieting. You know you should do it, but it isn’t a lot of fun. “Financial entertainment”—programs, incentives, games and devices that make thriftiness more fun—can help ease the pain. Here’s how: Watch the pennies, and the dollars will ... Read the entire article. Americans arrange for more than two million funerals for their families and friends each year. Some people spend more for a funeral than for any other single "item" they buy. According to the National Funeral Director's Association, the average cost for a funeral in 2001 was $5,180 and does not include vault, cemetery, monument or marker, or miscellaneous items, such as flowers, burial clothing, or newspaper notices. It may well be the third most expensive purchase for most people after a home and a car. Below are some tips for cutting funeral and burial costs while maintaining the dignity and spirit of the occasion. It also gives suggestions of other things to check on after a death occurs. 1. If you do not know whether the deceased had made and paid in advance for funeral and burial arrangements, call local and nearby funeral homes and ask if they have any record of such arrangements. Be sure to examine all papers of the deceased and look for funeral and burial contracts. Neglecting to check out the possibility of such arrangements could result in unnecessary expenditures for survivors. 2. If the deceased and the family of the deceased are extremely poor, check with the local ... Read the entire article. Go to the library and check out a bagful of books for each child and read to them every day. This is a special time of closeness and it will help them to enjoy reading more themselves. If your child struggles with reading, get a good phonics program, and help him develop good reading skills. Give a small spiral notebook to each child to record each book (maybe just the thicker ones) he reads by himself, along with the date. He will be glad someday that he did. Choose appropriate scripture verses for you children to learn during the summer. If they are teens, let them choose their own. Navigators has small folders especially for scripture memory verses or the verses can be written out on index cards to carry with you. Now is a good time for your children (and you) to just review the many scriptures already learned from previous years. I learned a lot of verses especially as a child, and to review them now (including the references) is very helpful. Another good way to brush up on scripture review is to record five to ten verses and play the recording every night before bedtime. In the case of young children, this would be great to play just before nap time or a quiet time (as mentioned below). Help your children to develop their abilities and find their talents. Ask each child to choose several creative skills (with your assistance) to learn this summer. It may be sewing, cross-stitch, making mirrors, pillows or other crafts, wood working, wood carving (if old enough to handle a knife), drawing, painting, singing, playing a musical instrument, typing, writing poetry, writing short children's stories, rubber stamping, or a variety of skills. Help your child find books on the subject and read up on it. Many skills can be learned simply by following instructions in books. Or if you or your husband can teach that skill--great! If not, find a teacher for him or even learn the skill with your child. Another possibility is to swap skills with a friend---maybe she or her husband could teach your child how to do wood carving and you teach her child how to do cross-stitch. If your children are very young, give them an art lesson at least one day each week, and possibly a simple cooking lesson another day (maybe with a friend). Cooking is something everyone should learn, whether young or old, male or female. I taught my children how to cook, as far back as when Read the entire article. Article source: AARP Bulletin Today - March 2010. Q. Anybody have suggestions on keeping a toddler busy so I can have time for the new baby in the home and have time to spend with my older girl so she's not glued to the TV? Answer. The first and best suggestion I can give is to get and learn how to use a sling. Once you know how to use it with confidence, you'll have both hands free to do other things. You can even nurse virtually hands free! I know my toddler loves going outside for walks or collecting fall leaves in a basket (baby kept warm and happy carried next to you in a sling). You could also sling the baby while coloring, building with wood blocks or mega blocks, reading books, or finger-painting (1 cup flour, 1 cup water, 1 tsp salt, and food coloring). My toddler also likes "helping" with sweeping the kitchen floor, vacuuming, and putting toys away. We bought her a toddler sized broom ($6) and vacuum ($10) ....you can do almost any stand up chores (except dishes) with the baby in a sling. A lot of malls have toddler/preschool play areas that you could go to during the day (they are less busy during the day...so safer for younger toddlers) and the sling would let your hands be free to help your toddler climb around. See what I mean about it being so helpful? Answer. My two children are 14 months apart, now 4 and 5. You expressed concern about keeping your older girl occupied and not glued to the TV set. What I have to suggest may sound severe but I firmly believe that it is one of the best things I ever did for my family..... GET RID OF THE TV. I never thought I was the kind of mother who used tv as a babysitter until we got rid of ours. Several times a day I would find myself thinking, "Is Dragon Tails on yet?" This only lasted for about a week. Without the television draining energy from my children they PLAY. I don't need to furnish anything more than the boxes of crayons, stencils, and papers that are under the coffee table. They will play with play-dough for literally hours at the dining table. All of these things I get at a dollar store. When mine were that little I used to put dried beans in different sized containers in the high chair and hand the children a spoon. They would sit there developing their hand-eye coordination and other skills by transferring the beans from one container to the other. Muffin tins are great too. Answer. If the idea of not having a TV makes you feel isolated keep in mind that the internet is a much better source of ... Read the entire article. There’s no law or ethics rule that says you have to pay more in taxes than is legally required. You should make the most of every credit and deduction that’s coming to you. This year, there are a lot of new write-offs in addition to a host of existing deductions you may have overlooked before. Maybe you can still trim your taxes for 2009. If you don’t itemize, don’t worry Many older taxpayers find they don’t have enough deductions to justify itemizing them, especially once they’ve paid off their mortgage. That’s not such bad news. In the first place, anyone over 65 gets an extra $1,400 ($1,100 each for spouses filing jointly) added to the $5,700 standard deduction ($11,400 for joint filers) they can take instead of itemizing. Car taxes. If you bought a car between Feb. 17 and Dec. 31, 2009, you can deduct ... Read the entire article.